This is a real special confluence of events and love and fandom. We love it when things like this happen. A collaboration of for the ages. Long time fan Jack White (White Stripes, Raconteurs, Dead Weather), put Dex and his sister in the studio at his new Third Man Studio and came up with this 2-sided slab of hillbilly noir folk-blues. Side A is an unrecorded Dex original with Jack on bass and vocals and the the saw. Yes, the saw. Side B is an obscure blues tune by Geechie Wiley. Dex and Jack share the guitar duties on this one. This release is a real special confluence of events and love and fandom. We love it when things like this happen. 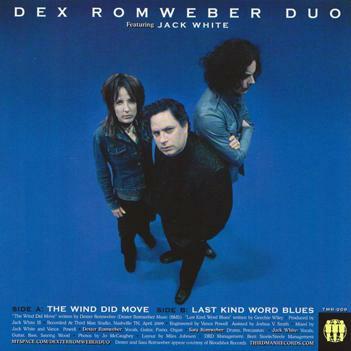 Dex Romweber Duo, "Jungle Drums"
Dex Romweber Duo, "Death of Me"